I figured I’d change this up from the standard construction update format. There hasn’t been enough development news tidbits this week to merit putting up a new entry; better luck next week, ladies and gents. 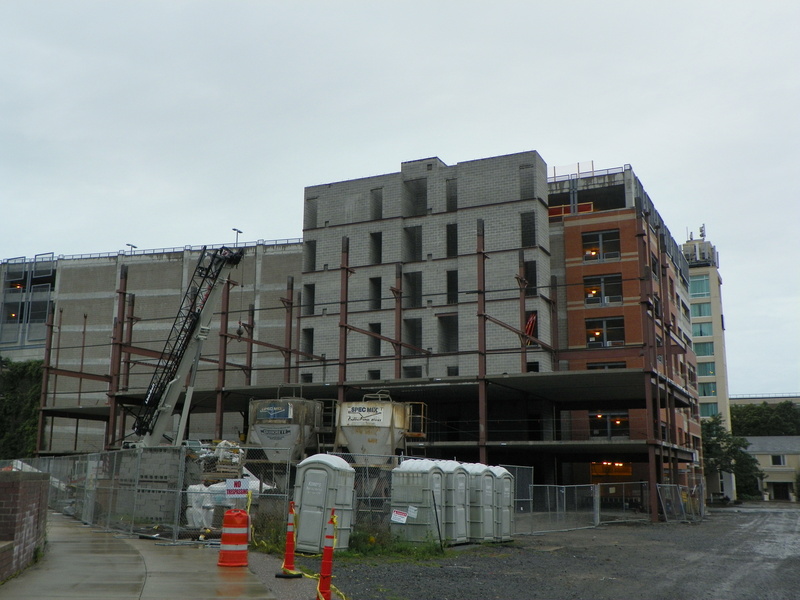 I was impressed by the Ithaca Times recent editorial, “The Mixed-Use Future“. It’s a piece that upholds the value of mixed-use projects and that single-use neighborhoods shouldn’t be maintained strictly because that’s the status quo. Mixed-use projects are something that have only recently picked up steam, as urban areas embrace new urbanist concepts in an effort to add vibrancy to decaying downtowns. 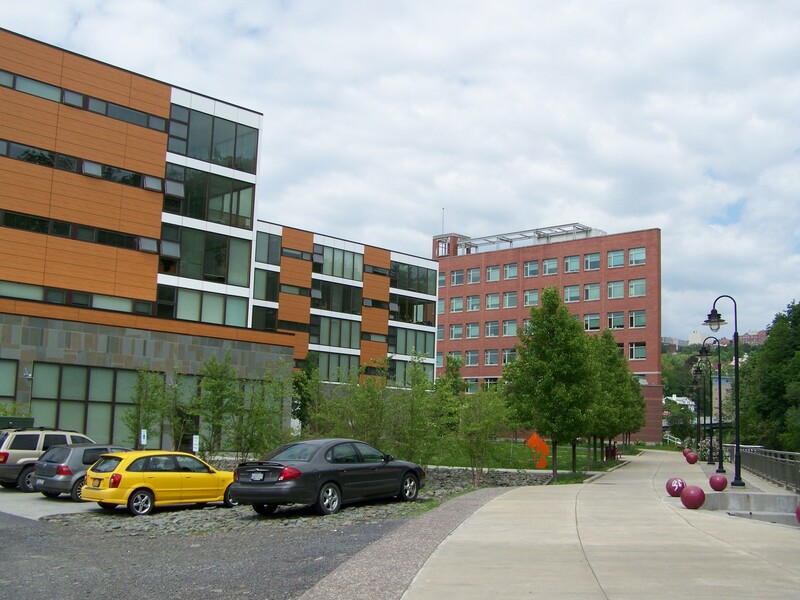 Ithaca has arguably been one of the most successful examples in upstate. But it had to work to get there, and the process hasn’t been without acrimony. I’ll rewind the clock back about 15 years to the start of the new millennium. Ithaca’s downtown was quite a bit different from today. There was no Gateway Commons, Breckenridge, Seneca Place or Cayuga Green. The Commons was plagued with high vacancies, severe enough that then-mayor Alan Cohen was mulling over reopening it to vehicular traffic. The big news at that time was the county library’s plan to move into the old Woolworth’s on Green Street (which they purchased at low cost, the owner had struggled to fill the building after Woolworth’s closed in 1998). The last two newer developments I mentioned, Seneca Place and Cayuga Green, are closely tied together. 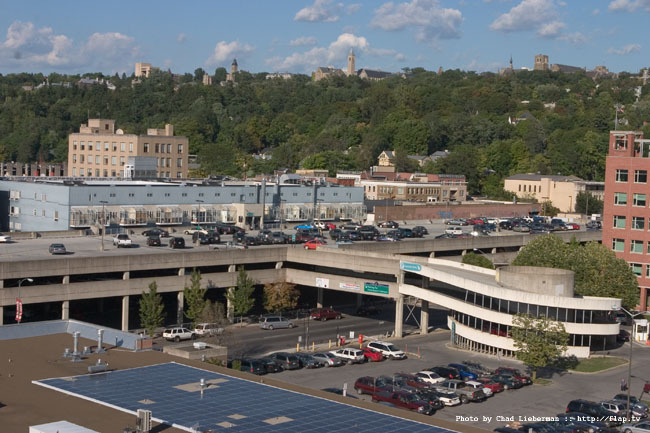 They and the Cayuga Street garage all depended on each other as the sort of “pie-in-the-sky” redevelopment plan that Ithaca desperately wanted. In the early 2000s, their working titles were the “Cayuga Green at Six Mile Creek” and “Ciminelli/Cornell Office/Hotel” projects, and collectively they were called the “Downtown Development Project“. Cayuga Green has heavy city involvement. 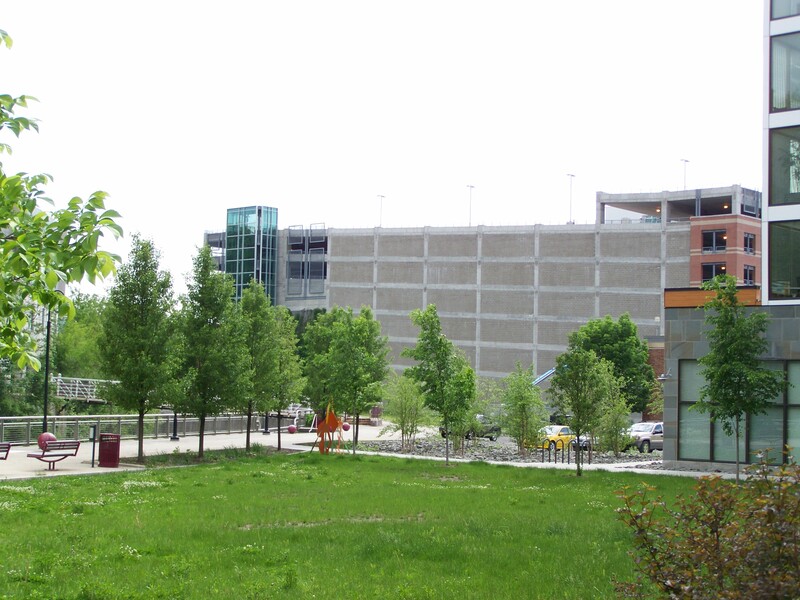 At the time, the swath of land surrounding the library on its block was all city-owned surface parking, with the helix for the Green Street parking garage to its east (it was actually kinda neat looking for a parking garage ramp; a photo can be found here). The first phase of Cayuga Green would also be the lynch pin for the Ciminelli project; the city would convey the parking lots to the IURA, who could sell them off and partner with a developer to build a parking garage to serve the Ciminelli building and some of Cayuga Green. This phase would become the current Cayuga Street garage, which opened in June 2005 with 700 spaces, 34,000 sq ft of first floor retail, and a nearly $20 million price tag. 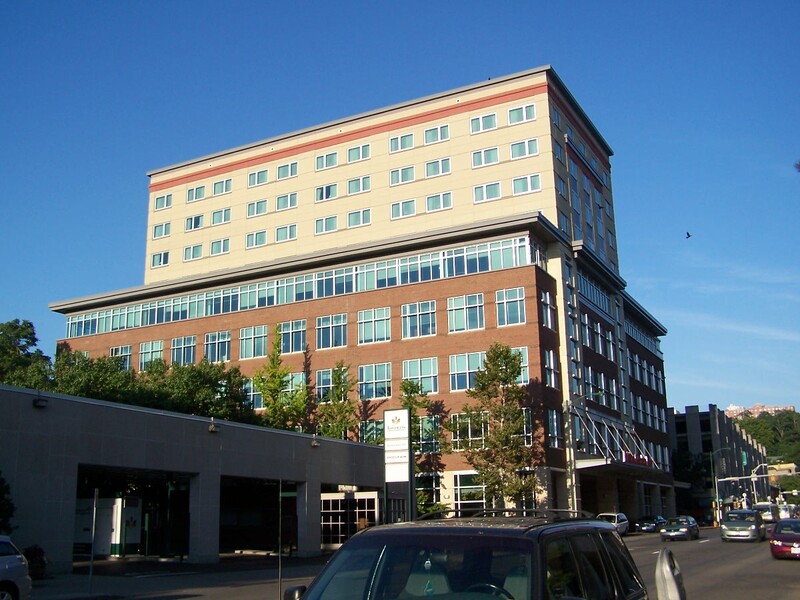 The 185,000 sq ft Ciminelli project was constructed concurrently and also opened in 2005 as Seneca Place on the Commons, with the Hilton Garden Inn for its hotel occupant, Cornell as the primary office tenant, and retail space that would fill up over the next couple years. Phase II focused on a couple things (IIA and IIB, technically). The Green Street Garage would be redeveloped, the helix torn down, and a movie theater would go in the renovated space under the garage. The city owned the top two floors of the 3-story garage, and used eminent domain on the owner of the first floor. Originally, there was to be either 36,000 sq ft of retail on the first floor, or an intermodal transit center (a hub for TCAT and Greyhound/Trailways, essentially). The garage would add two more floors and have space for 1,082 cars. 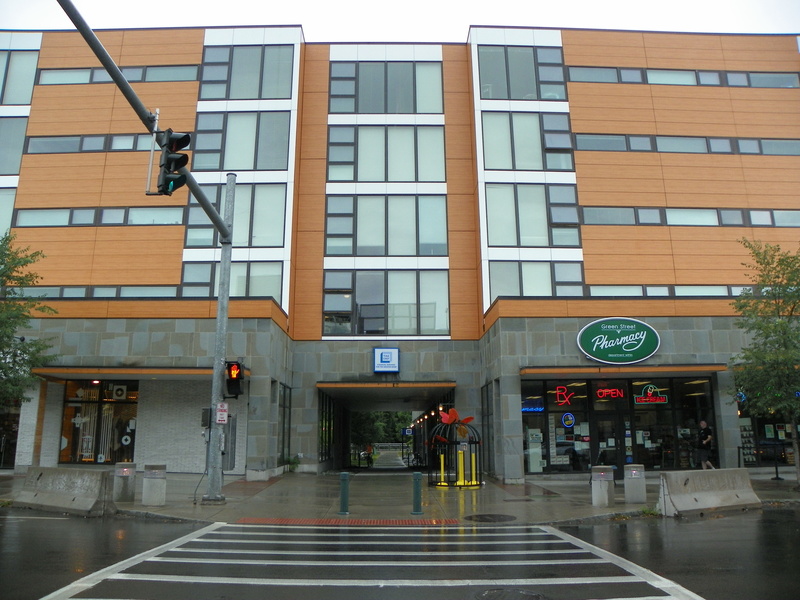 Perhaps thankfully, this was never done (though the zoning was raised from 60′ to 85′ for the land that the Green Street garage sits on). The Cayuga garage picked up more retail space as the plans were rewritten. A 12 screen national theater chain was proposed for the retail space of the Green Street garage, but given the plans for an expanded theater at the mall in Lansing, it became clear that such a project wasn’t feasible. By good fortune and negotiation, Cinemapolis agreed to take the space, and the theater shrank from 12 to 5 screens and went into the Green Street garage. IIB and Phase III are the residential portions, Cayuga Place Apartments and Cayuga Place Residences (Cayuga Green condos). As originally proposed, there was going to be 70 to 80 apartments with ground-floor retail, and anywhere from 40 to 122 condos. The city IURA had entered a contract in 2002 with Cincinnati-based Bloomfield/Schon to develop the units. The apartments were first proposed in 2005, and with abatements approved, the 68 units and 15,000 sq ft of retail space opened in 2008. The condos are a lot more complicated, bouncing between several iterations and layouts (here’s a few versions 1, 2, and 3, here’s 4 and here’s 5) before settling on the 45-unit design currently under construction. Part of the problem was financing, especially during the recession; a later problem was that the land along Six Mile Creek is not that great for construction. It will have taken 15 years, but the downtown redevelopment project will be complete next year. There’s been an enormous amount of controversy. A 20-year abatement was used for Seneca Place, the labor used in some of the construction was from North Carolina, and the fight with one of the property owners (Thomas Pine, who ran Race Office Supply on the corner of Seneca and Tioga) was pretty ugly. 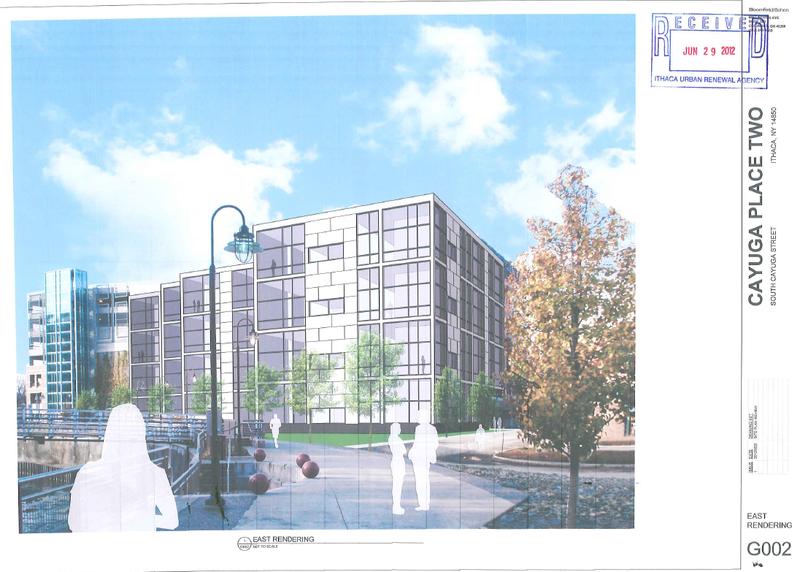 The fight over the apartments and condos was even uglier in some ways, because the developer requested and received a 10-year tax abatement (and the ICSD was not game). Instead of bringing new, permanent jobs like an employer’s new office or factory, this was housing, and it was market-rate and premium housing at that. The retail portion offered jobs, if they could lure shops, and retail doesn’t exactly pay well either. Some, such as local megalord Jason Fane, said the project would fail. There have been problems, certainly. The Cayuga garage has struggled to fill its retail space. Only now with the impending addition of TC3’s Coltivare restaurant and learning center has it filled most of the space (Merrill Lynch took the leap a few years ago and rents some of the space; then there was that failed wine tourism center). It has taken years for the condos to begin construction. But, slowly and haphazardly, the project is building up and out. Ithacans did a lot of soul-searching. Were the costs outweighing the benefits? 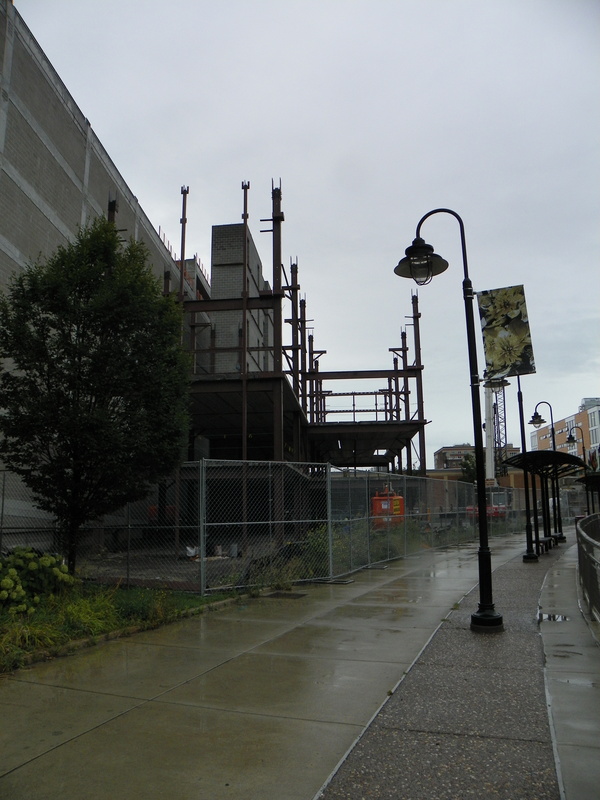 Was growth downtown, or even in the county, a good thing? Ask a dozen people and you’ll get a dozen opinions. I think that for all the problems and strife, that the city has benefited from the downtown projects. Through local character and some luck, the downtown residential units are full and most of the retail space is occupied. Seneca Place and Cayuga Green demonstrate that mixed-use can add life to underutilized parcels and spark interest in neighboring properties. Each project should be weighed carefully, of course. But thanks in part to active urban reinvestment, Ithaca is in a position many upstate cities envy. Thanks for this post. 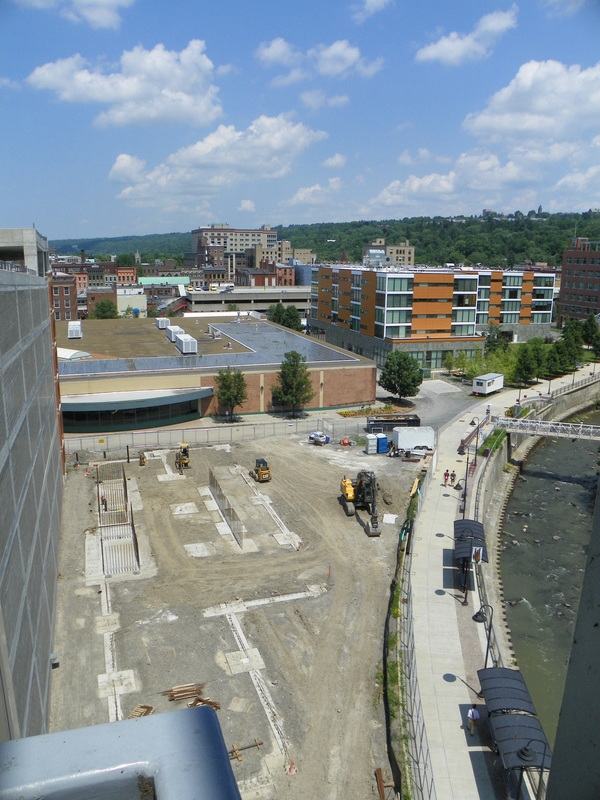 Having just moved here last year, it’s hard to even imagine downtown without these projects having been completed…and how little downtown Ithaca must have changed from the 1970s until then. Viewed in light of all the challenges these projects faced, the city’s continual efforts to inject life are all the more welcome. I wonder if Cornell and IC could do more to encourage redevelopment (which can only be good for them in terms of boosting student/faculty recruitment) by shifting more admin work (or even some classroom/research facilities) downtown. I know Cornell hardly uses its offices in Seneca Place as it is but surely it must have plenty of admins who don’t absolutely need to be on East Hill. That said, a higher priority might be incentivizing more residential construction than true mixed-use; if you stuff enough residents downtown, more retail services, at least, will follow. The Ithaca of 2014 really is quite a change from the prevailing pattern in the late 20th century. For every “victory” for downtown, there was a setback. For instance, the Greenstate Building opened in 1991, and the Strand Theatre was torn down in 1993. The Human Services Building was completed in 1998, and Woolworth’s, the only large store in downtown, closed the same year. Essentially, it was a zero-sum game the city played with its stakeholders. I know a lot of folks have superficially encouraged Cornell and IC to invest more in downtown; but Cornell’s vast property holdings have more recently resulted in new non-academic investments on campus (convenience) or East Hill Plaza (cheaper land). IC doesn’t have much invested outside of its campus, a boathouse and a couple other small-scale properties. 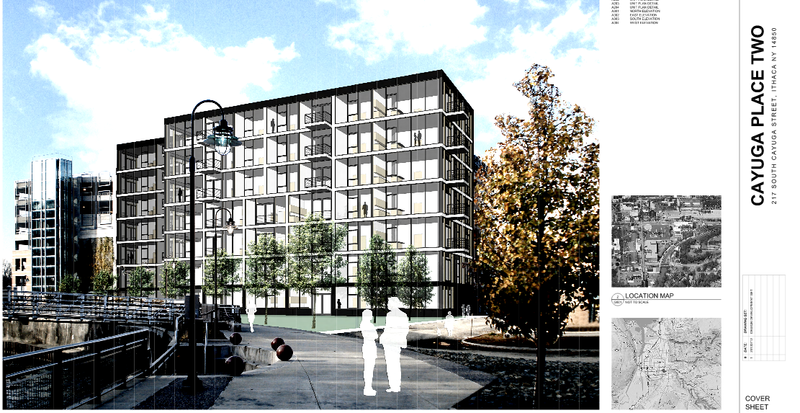 I give TC3 a lot of credit for their Coltivare project, and am hopeful it will extend downtown’s vitality southward. With Ithaca’s mixed results going into the Cayuga Green project, I can understand the concern with another large chain movie theater, and why they sought alternatives; if the theater had folded it would have weakened the position of city planners. A lot of the debate about Cayuga Green happened when I was applying to Cornell, and the fear of failure was strong. There are certainly more downtown proposals that never left the drawing board, and if I find info and renderings I’ll be sure to share them here. I look forward to buying a copy of John Schroeder’s “Unbuilt Ithaca” compilation when it hits the bookshelves.